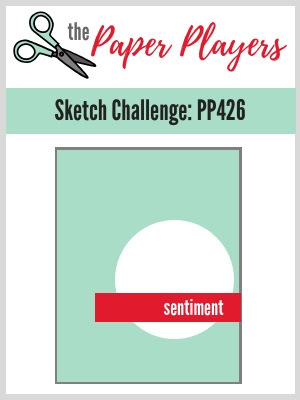 I’ve got a card today for the Paper Players sketch challenge. I did some more masking and inking although this time I used regular Distress inks and didn't have the paper pilling problem like I did yesterday with the Oxide inks. These Heffy Doodle stamps are NBUS so I was glad to put them to work especially since I can't keep up with the demand for Valentine's cards right now! This is so cute! I always love a punny sentiment!!! And your masked inking looks fantastic! Jen, you’ve mastered the masking and ink technique! And, your sketch with this cute, little guy is spot on! Thanks for joining us at Paper Players! There's my pun loving girl! So fun, Jen, but who's demanding valentines? Paper pilling? that doesn't sound like fun! Love your fun design today Jen! This is just way too cute! Perfect little dino against the (regular) distress ink circle.